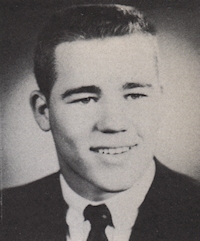 Obituary – McDaniel, Robert F. « Perry High School Alumni Association, Inc.
Obituary – McDaniel, Robert F.
﻿Football Co-Captain 54, Football 51-55, Baseball 51-55, President of Sophomore Class 52-53, National Honor Society 53-54, Vice-President of National Honor Society 54-55, Boys State 54, All School Revue 53-54. Robert F. “T Bob” McDaniel, 72, of Perry, Oklahoma was the son of Bettie Leora Burns McDaniel and Alfred Ross McDaniel. He was born May 18, 1937 at Marshall, Oklahoma and died Friday, July 3, 2009 at the Odyssey House in Oklahoma City, Oklahoma. Bob was a 1955 graduate of Perry High School. On June 6, 1958, he and Doris Ann Hayne were married at Christ Lutheran Church in Perry. He began his banking career at Exchange Bank and Trust Company in Perry in 1954. Bob became president of Exchange Bank and Trust in 1982 and Chief Executive Officer in 1996 before retiring in 2000. He had served on the Exchange Bank and Trust Company board of directors since 1965. Bob served on the Perry Board of Education and the United Fund of Perry, was a member of the Perry Noon Lions Club, the Perry Elks Lodge and was a coach for Perry Kids, Inc. 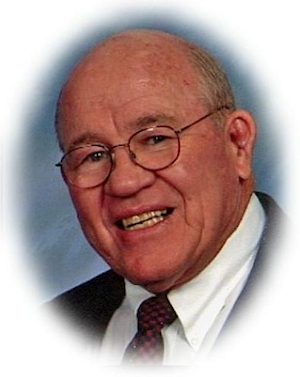 He was a member of Christ Lutheran Church where he served as treasurer and elder. Bob’s passions were his family and baseball. He enjoyed traveling, fishing, target shooting, gardening and yard work. Funeral services will be 10:00 a.m. Tuesday, July 7, 2009 at the Christ Lutheran Church. Rev. William Metz will officiate. Interment will be in Grace Hill Cemetery. Services are under the direction of Brown-Dugger Funeral Home. The family will receive friends from 6:00 p.m. to 8:00 p.m. Monday, July 6, 2009 at Brown-Dugger Funeral Home. Memorials may be made to the Jason Scott Waltermire Memorial Fund or the Christ Lutheran Church in care of Brown-Dugger Funeral Home, 1010 N. 7th Street, Perry, Oklahoma 73077. In addition to his wife, Doris, Bob is survived by two sons, Bradley McDaniel and his wife, Jamie, of Pryor, Oklahoma and Barry McDaniel and his wife, Dana, of Enid, Oklahoma; one daughter, Brenda Waltermire and her husband, J.B., of Stillwater, Oklahoma; five grandchildren, Chad McDaniel and his wife, Betsy, of Oklahoma City, Oklahoma, Erik McDaniel of Enid, Oklahoma, Amie McDaniel of Perry, Oklahoma and Brigette Waltermire and Sean Waltermire, both of Stillwater, Oklahoma; one great-grandchild, Adyson McDaniel, of Perry, Oklahoma; two sisters, Betty Robbins of Perry, Oklahoma and Lynda Dolezal and her husband, Tom, of Billings, Oklahoma; and numerous nieces and nephews. Bob was preceded in death by his mother, Bettie McDaniel; father, Alfred McDaniel; four brothers, Howard, Kenneth, Keith and Ross; and one grandson, Jason Scott Waltermire.